St. Benedict of Nursia whose feast day is July 11 (March 21 traditional) is, among other patronages, the saint invoked against poisoning. There are a couple stories associated with him where he was spared of poisoning. In one depiction Benedict was given poisoned bread by priest who was jealous of him and his fame. Knowing that the bread was poisoned St. Benedict called to the raven (or crow), who would often come and feed from his hand, to take it away to a place where no one could eat it. The raven flew away with the poisoned bread in his beak and disposed of it, then returning to be given rations from St. Benedict. You can read the episode yourself in The Dialogues of St. Gregory (Book II, Chapter 8) which is the life of St. Benedict. 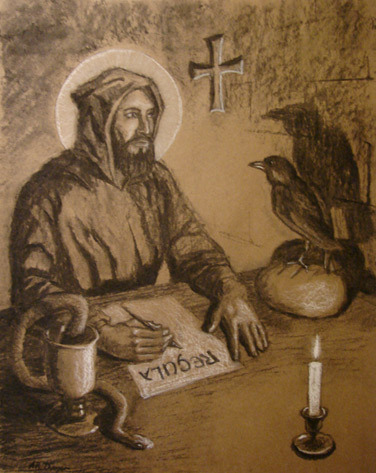 Due to this and other stories, the raven is often depicted with St. Benedict in pictures. It is the mascot of many Benedictine schools. So since the bread and raven are noteworthy symbols associated with St. Benedict, this very simple feast day idea came to mind. I know as busy parents it is always nice to have something that is really easy to put together without a lot of effort. Bread is something we usually have on hand, or is easy to obtain. Any kind will do and if you have special dietary considerations can choose a suitable bread as well. And if you have more time, it is also possible to bake your own bread for the feast using one of the many past recipes here at Catholic Cuisine. I went the easy route and picked up a boule of Italian bread from the store. Then I sliced it up and served it with the raven mascot looking on. 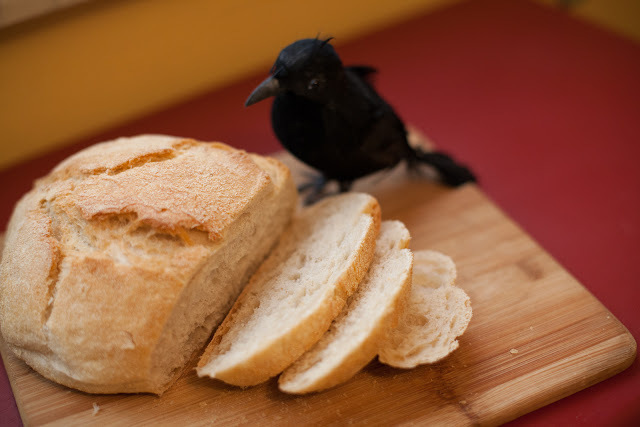 We happen to have a couple fake ravens/crows in our decoration but a simple alternative if you don't have a plastic raven/crow handy and don't want to get one (readily available around Halloween) - use a paper silhouette you can print out and place as guardian of the bread at your table. This site has some great raven/crow silhouettes in their free clip art, including this one - Raven Silhouette Clipart. St. Benedict, Pray for Us! This is such a neat story that I had never hears! My son is named Elijah Benedict so I was looking on this site for a recipe for St. Benedict's feast day tomorrow and I came across this; how fitting for BOTH his patrons! (The raven story, that is.) Thanks for sharing!